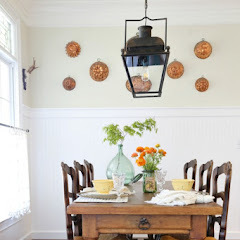 I'm Amy from Atta Girl Says, and I can't express what a thrill it is for me to be sharing my favorite room today on Kim's blog. 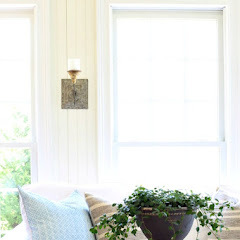 When we moved into our new home almost two years ago, I started searching the Internet for design inspiration and I discovered the amazing world of home decor blogs. Savvy Southern Style quickly became one of my favorites. It was required arm chair reading every night, and it still is. 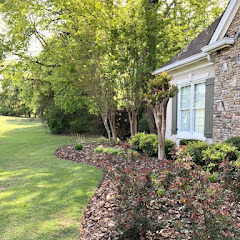 It's hard to pick a favorite room in your dream house, but today I'm sharing a tour of our master bedroom and sitting room. It truly is a retreat, and I think it's very reflective of my style. I've always had a thing for blue bedrooms. Blue is such a serene and calming color, and a bedroom decorated in various shades of blue is the perfect place to wind down after a busy day. 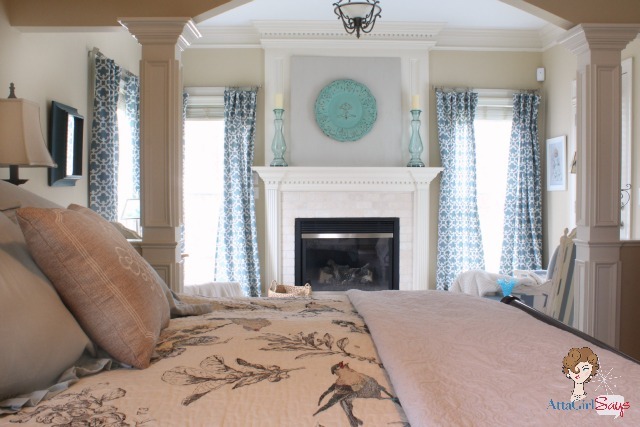 You'll find just about every shade of blue in our bedroom -- pale powder blue, Wedgwood blue, Tiffany blue, Aubusson blue, Williamsburg blue, Duck Egg blue, Louis blue and so many more. Our bedroom also showcases my love of mixing patterns and fabrics. I love to pair florals and geometrics and stripes together. In this room, that mix of patterns happened quite by accident. Before we'd even settled in the house, I purchased this Harbor House Pyrenees comforter and shams because I fell in love with the birds. I knew I wanted some French-style chairs for our bedroom sitting room. Initially, I had my heart set on some bergere chairs upholstered in a natural linen. Then I saw this pair of blue-and-white striped chintz French chairs at a local furniture consignment store. (They were samples from the High Point Furniture Market.) And I knew they would be perfect for our bedroom. Certainly not what I had imagined for the room, but so perfect for it. Admittedly, they are very girly, but they are also comfortable. My husband spends a lot of time in them watching sports on TV and reading. It's nice to be married to a man who isn't intimidated by a girly French chair! Those chairs are a perfect spot to read and have a spot of tea while sitting in front of the fire. The curtains were another accidental find that inched our master bedroom closer to completion. As soon as I saw these Farrah Fretwork curtains at Target, I knew I had to have them for my home. I initially bought two panels, just to try them out. I didn't really know where I would use them -- maybe in our living room. They were too short for the tall windows in there, but as luck would have it, perfect for the bedroom. 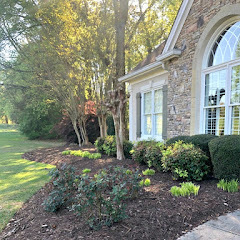 Then commenced a search of eight Target stores, all over North Carolina, to find enough panels for all the windows in our bedroom and sitting room. Boy, is that a story -- my curtain odyssey. The rest of the room is all about the details. 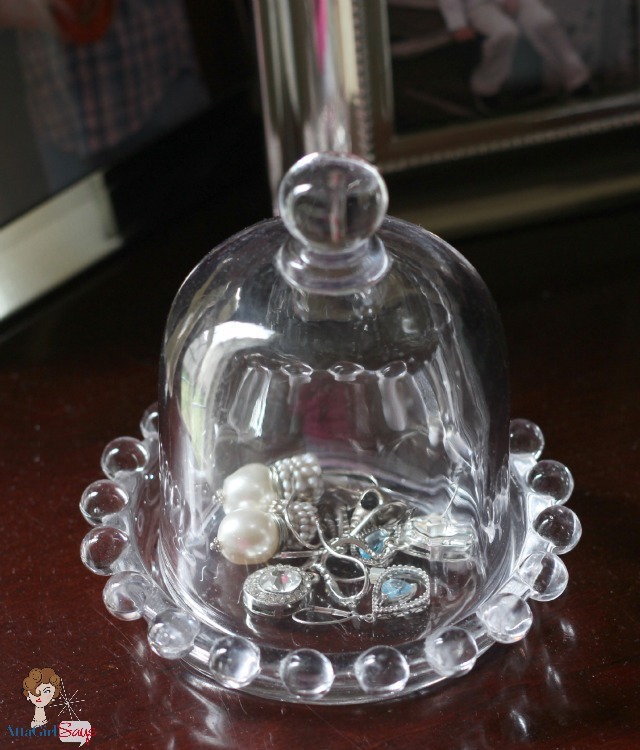 I like to keep my favorite jewelry under glass on my nightstand. Look, even my earrings are blue! As we've toured the bedroom, you may have noticed I have a bit of a bird obsession. They've come to roost everywhere in the bedroom. 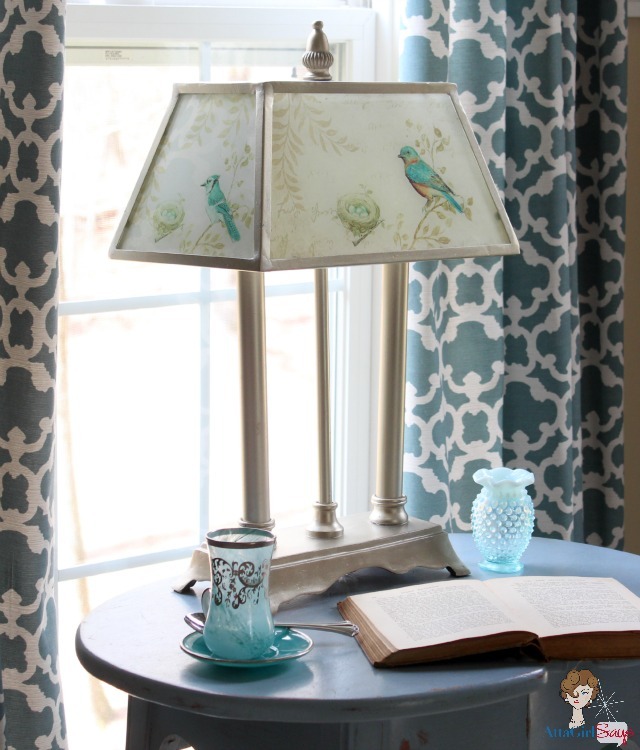 This brushed nickel table lamp has the most enchanting glass shade decorated with birds. I bought it at The Red Collection, one of my favorite local consignment stores, which is reportedly the largest consignment store in the southeast. I actually have not one, but two, bird lamps in the master bedroom. I love the hobnail glass globe and vibrant shade on this wrought iron floor lamp that came from my favorite place in the world to find antiques and vintage home decor items. And, of course, there's our bedding. Birds, birds everywhere. Enough to make a Hitchcock movie! Thanks for coming along on my tour of my favorite room, our master bedroom and sitting room. And thank you for Kim for allowing me to share here on your blog. I hope you'll all come over to visit me at Atta Girl Says, where I share ideas to make your home brighter and your heart lighter. Thanks, Amy for sharing your beautiful master with us. I would love a fireplace to snuggle up by. Okay y'all, I hope you will pop on over to Amy's and look around and say hi. where I am being interviewed by Anita on her back porch. See you there. Have the best Easter weekend ever! If you missed the past favorite rooms you can catch up here. Oh how gorgeous! This is one of my favorite bedrooms. Love her fireplace and all the pretty accessories. Great favorite room! Love the bedroom Amy...I knew we had a lot in common in our decorating as we both love blue bedrooms and birds!...and I am so jealous over that fabulous fireplace in the room...how beautiful...! !...just love all of the beautiful furniture in the room especially those chairs...! Thanks Kim for sharing Amy's favorite room...Happy Easter!! 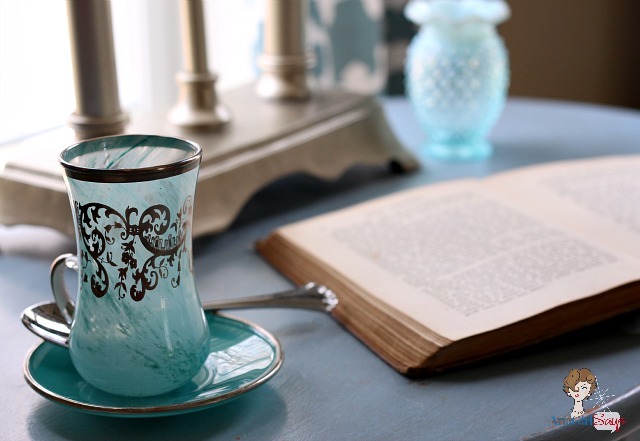 In general, I am not drawn to blue -- but your room is beautiful, calming and so serene. I love your neutral walls with blue furniture and accessories -- a great look. I love birds too, and it was fun spotting them around your room. Thanks for sharing! I love Amy - she is so funny and sweet! 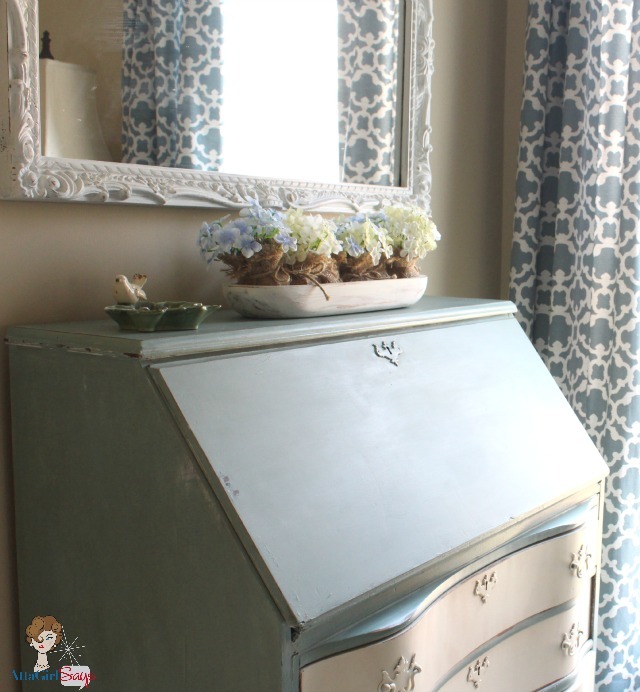 Now I love her bedroom too - those bird lampshades are gorgeous and love the jewelry cloche! Everything about this bedroom down to the very last detail is gorgeous!! Wow what a beautiful retreat. Amy's master bedroom is so gorgeous. Ohhhh to have a fireplace in the bedroom so romantic and beautiful. What a wonderful retreat to retire to each evening. Thanks for sharing Amy's beautiful room with us Kim. Happy Easter. Beautiful room! 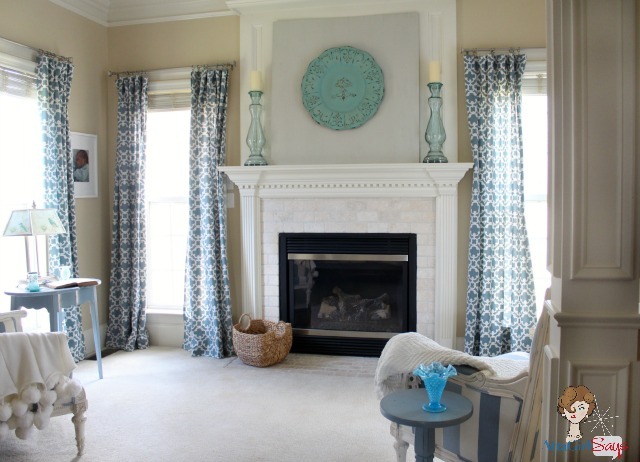 I love the fireplace, all the blue accents and patterns, indeed calming and serene! What a luvly room. Luv all the attention to detail. The birds :-) ... the comfy chairs and the fireplace... dreamy! Absolutely Beautiful!! 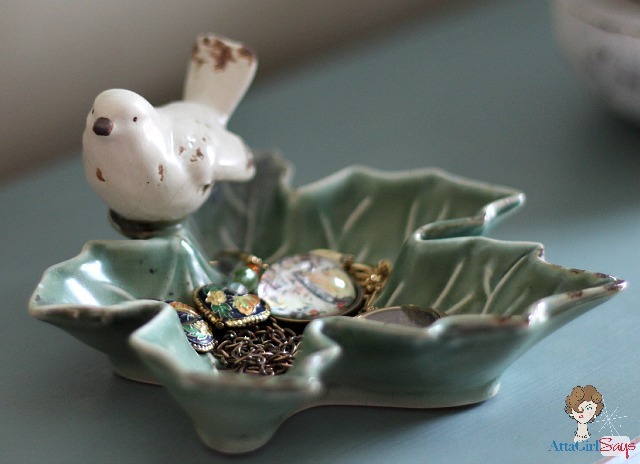 I love the soft colors and love the birds! Her painted pieces look amazing! Such a beautiful bedroom and sitting room! Love the various shades of blue. Those chairs are great! What a find! Love the desk, too. Great detail and color combo. 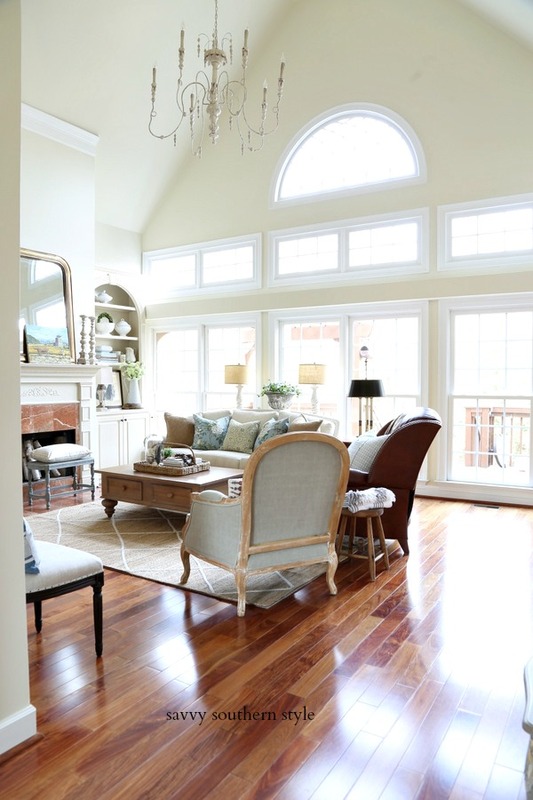 A very restful room that makes for a wonderful retreat! Thanks for sharing, Kim. What a beautiful bedroom....love the blue! beautiful! thanks for sharing Kim. Thank you everyone for all your wonderful comments. And thank you to Kim again for featuring me. I hope everyone has a great weekend and a wonderful Easter. Thanks so much for sharing Amy's beautiful room! And I love those curtains! Have an awesome and blessed day rock star! Such a pretty room! I love those drapes so much. I have them in my dining room. Such a find! Amy's bedroom is beautiful. 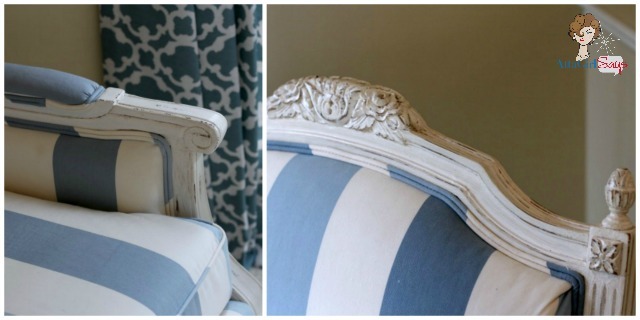 All the blues work so well together and I love the striped chintz French chairs. Beautiful room. Love all the blues and those chairs...such a GREAT find! This is GORGEOUS!! I was just lamenting not having a fireplace in my post today and then I see this? Well it might put me over the proverbial edge. lol But, I DO actually have those curtains in our Master so it's a start… haha Love this space!! Very, very pretty. 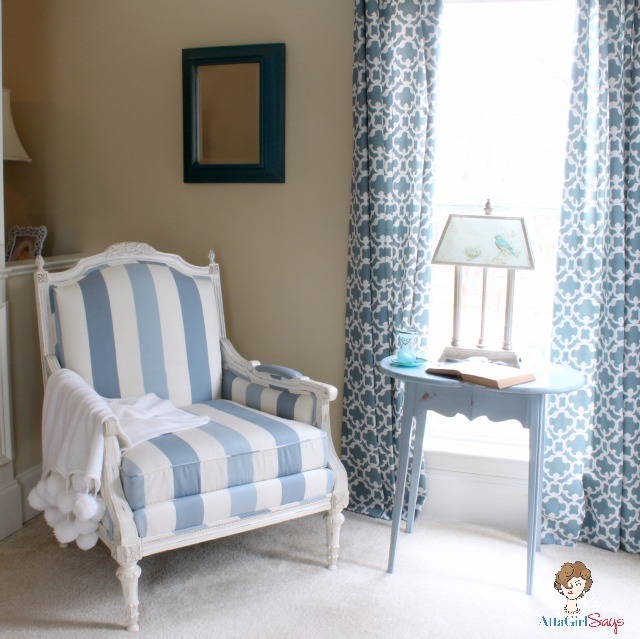 Yes, calming is the perfect term for this room. I recently moved into a rental. My landlord said I can paint as long as I don't go extreme. I love soft, pastel colors. He really has nothing to worry about lol. This post has given me some wonderful ideas for my bedroom. The house is a good size and I have lots of space to decorate. I don't want to go too far. Not sure how long I will be in this house, but it will be for a good deal of time as I am not a frequent mover. Thank you so much for this posting! So glad that you featured Amy's favorite room today! I've seen her bedroom in person and can attest to how gorgeous it is. Amy has such a great style and it is reflected throughout her home! Amy, your room is beautiful! 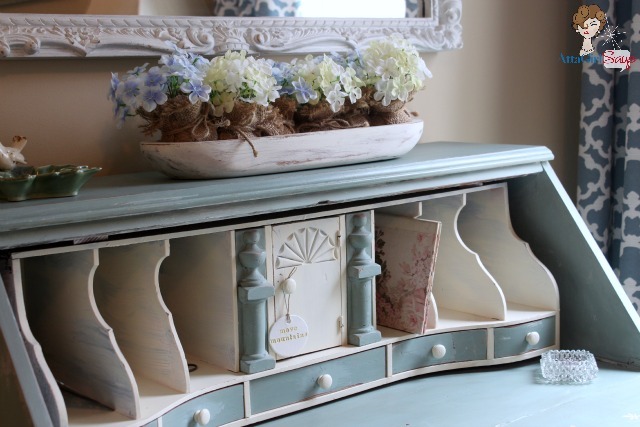 Love how you've layered everything over time and the blues are so soothing. 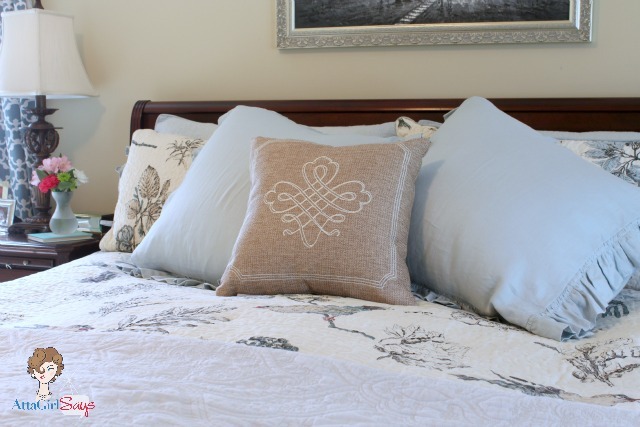 I had picked up your same comforter for my mom's master bedroom makeover last year, but it ended up not working, so returned it, but I always thought it was such a pretty comforter. You've done a wonderful job! Beautiful room! Love every detail. Could you tell me the name of the paint color on the walls? Did you say, "Largest thrift store in the Southeast????" Please, do tell more! 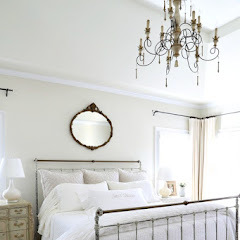 Stunning bedroom..the prettiest I've seen lately!! 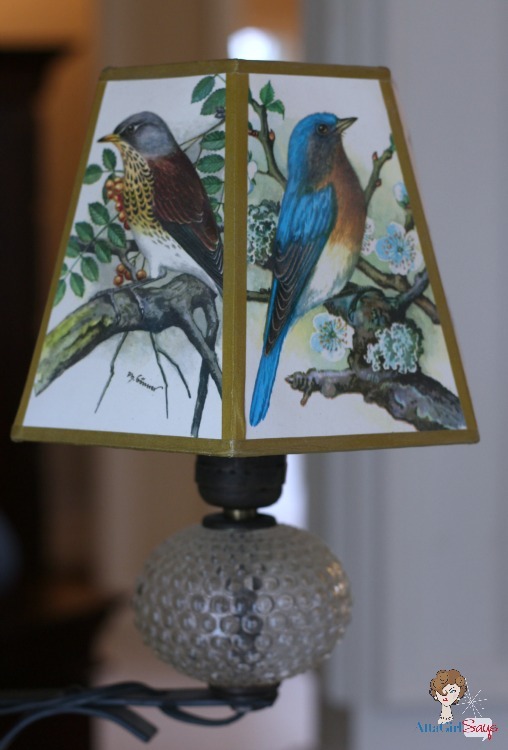 I also love the lamp with the birds. Beautiful! Enjoy your week.